We’ll soon be switching to a new authentication system for QuickBooks® Payments. 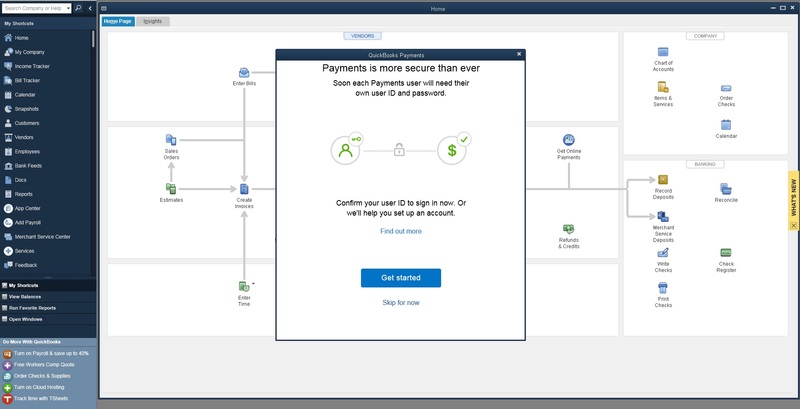 In order to continue processing payments, you’ll need to either confirm your Intuit user ID and password in QuickBooks Desktop or create an account to link to your QuickBooks Desktop file. For your convenience, we’ve extended the deadline for this to March 31, 2019. By taking action now, you will still be able to process payments immediately even if further review, such as requesting access from your admin, is required. After the deadline, you’ll be asked to follow the setup instructions and will not be able to process your payment until the setup is complete. Make sure you have the latest release of your QuickBooks Desktop version. Click Help > Update QuickBooks Desktop and choose “Update Now.” Then, choose “Get Updates.” Once you’ve done this, you’ll need to close QuickBooks and reopen it. Then, confirm or create your account. Click Customers > Link Payment Service to QuickBooks Company File. This will launch our in-product guide. Note the guide may also launch automatically once you’ve updated QuickBooks to the latest version. Once you’ve completed the in-product guide, you’re all set. For more information about confirming your Intuit user ID or setting one up, check out our detailed community article. If you need help, just press F1 while in QuickBooks Desktop, and search for “secure payments,” then click Contact us for contact options.